If you own a circular saw, or are thinking about buying one, then probably the next most important thing to consider is the blade type. There is no doubt that circular saws are one of the most useful tools to own. We also know that picking the right circular saw blade can get confusing. In our guide below, we take you through, exactly what you need to consider, before spending any of your hard earned cash. What Materials Can A Circular Saw Cut Through? This is a question that I am often asked. With the right type of blade, a circular saw can cut through most materials. Those include plastic, fibre glass, wood, metal and masonry. Now almost always a circular saw is used to rip through wood. By changing the blade, it can also get through plastic. It can also cut metal, but that is not normally what a circular saw is used for. It will work ok on things like conduit or trunking, but it is not a good choice for heavier metals. Stick to a metal saw for that type of work. Likewise with concrete. Although you can get a circular saw blade suitable for masonry, you will always be better using an angle grinder, or a masonry saw. As I mentioned, these saws are designed for woodworking, and for that you can get different thickness of blades, depending on what type of finish you are trying to obtain. Some blades will rip through wood, even with nails in it. If however you want a smoother and neater finish, then you are better off with a finishing blade, for a much smoother cut. Below you will find a very thorough and detailed guide on how to buy the right blade for your needs. I also know that some of you may be in a hurry, so just below I have placed a table, that show the top 10 best buyer rated circular saw blades. If you click on the product name, you will be able to read a concise summary review of each blade or set of blades. In the remainder of this article, I will be going into a lot of detail, though I have tried to keep this as simple, and easy to understand as possible. What Are Circular Saw Blades Made From? They are made from steel. To be a little more specific though, usually they are made from steel that has been tungsten carbide tipped (TCT). That means the teeth on the saw blade have been treated and hardened, to make them last longer. The vast majority of blades are treated like this. Some circular saw blades are also made from what is called high speed steel (HSS). In the factory, a laser cuts out jagged discs. Tensioning grooves are then pressed and rolled into the blades, that help keep the blade from wobbling. The blade is then polished by using a grinding wheel. The blades are then baked in an oven until they are really hard. After that carbide tips are added to the teeth of the blade. After that each individual tooth is sharpened, and the correct cutting angle is made. Finally they are inspected for quality and then labelled. This is where many people can easily get confused when buying a circular saw blade. There are two very important sizes to understand and once you understand those, then it becomes very easy. Almost always it is a good idea to buy the brand blade that is suitable for your saw. That generally makes life easier, but you don't have to do that of course. The diameter is the most important measure to get right. The saw you own or have borrowed has been designed to use a specific size of blade. That is the only size that you should use with the saw. The saw that you have will also have a bore size and again these sizes vary depending on the manufacturer. The most popular sizes are 20 mm and 30 mm and some saws, mini circular saws may have 16 mm bores. You can also buy reduction rings. The purpose of those is that if your saw had a 30 mm bore, but you prefer to use a blade with a 20 mm bore, then you can add a 20 mm reduction ring to your saw, and then the blade would fit. Understanding the Number of Teeth on a Circular Saw Blade - Why Does it Matter? This is probably one of the most misunderstood things when it comes to buying circular saw blades. Do the number of teeth on the blade really matter that much? Let's find out more about why the number of teeth matter. If you don't want to buy two blades, then you can use a combination blade that usually has 40 or 48 teeth. (40-50 teeth) The problem with combination blades is they don't rip as well as a ripping blade, or do as fine a cross cut. However for most people and for anyone who does DIY, then a combination general purpose blade will do a good enough job for both types of cut. They do save you money having to buy two blades, and they also save you the time and effort of changing the blade. Please remember the above information is for natural wood and not for MDF, laminates, composites etc. These are woods like plywood, MDF, chip board etc all of which are manufactured boards. There is no definition of grain in these, and in fact the grain is considered to be very random. With reference to blades you are in effect both ripping and cross cutting at the same time. For that type of wood you should use something like a 60-100 teeth blade. Again it is also fine to use a general purpose combination blade to cut these types of manufactured woods. What Types of Circular Saw Blades Are Available? As I mentioned blades are designed to cut different materials, and work with different sizes of saws. The blade that you pick needs to fit your saw. I have explained how to do this, later in this article. These can be used for hard woods, softwoods, plywood and some veneers. They are truly the handy mans of DIY person’s friend. They are also ideal for anyone who has a wood related hobby. They cover a range of tasks and are ideal if you don’t always want to be changing blades. These are often referred to as multi-purpose blades, as they can also be used to cut through plastic, and wood with nails left in. Below, I will cover off all of the different types of circular saw blade. Don’t worry though, the reality is that you will only ever need one or two of these, but at least you will know what is available. As the name would suggest, these are used specifically for cutting through plywood. They can also be used for cutting through larger sheets of wood. Almost always they will have 100 teeth, and that means you do not get a ragged edge. A cross cut is a cut that cuts across the grain of the wood. Typically they will have 48 teeth or more. They also have built in what are called “gullets” and these ensure a smoother cut. A rip cut is a cut in wood that cuts along the grain. This type of blade will not have that many teeth, but it will have larger gullets, as they are good for chip removal. These are expensive and are used for the tougher jobs such as cutting concrete, ceramic and glass. If you need a really smooth cut, across the grain, then you will need one of these types of circular saw blade. They have a thinner body which helps prevent stick and binding. This is a blade used by businesses to cut engineered lumber. They are also great for those who want a nice fine cut or a neat finish. The kerf is basically the thickness of the blade. The thinner that is, then the finer a cut you will get. Which Circular Saw Blade Should You Buy? The good news is that a general purpose, combination blade will do almost any job. If you want a finer and neater cut, then buy a thin kerf TFT blade with about 24 teeth. If you want an even finer finish, then get a 40 thin kerf tooth blade. 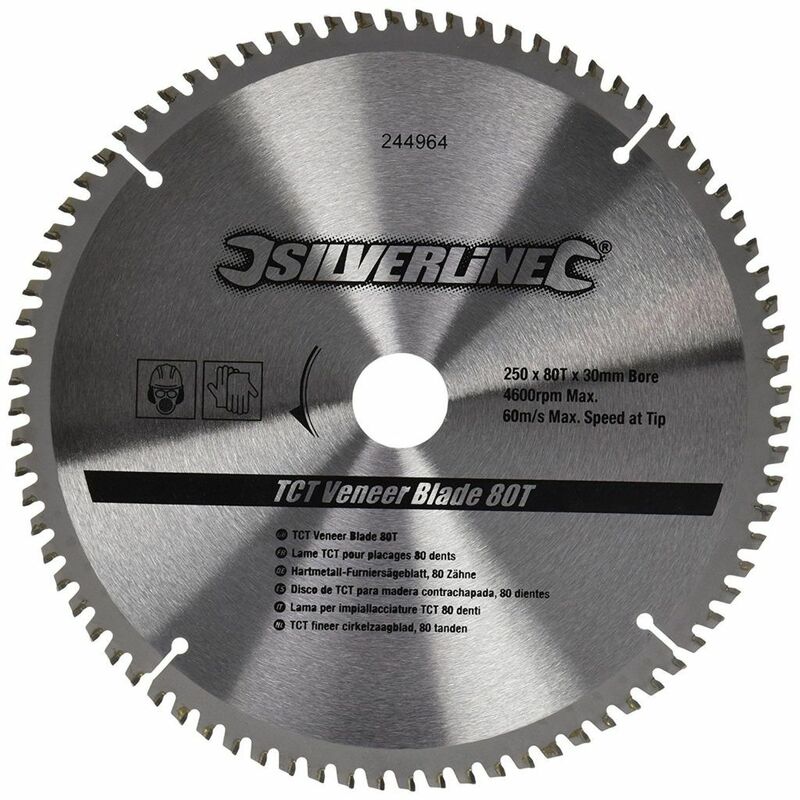 Something like an 18 or 24 teeth TFT blade is a very good choice. Buy what is called a dry cut diamond blade, and that will get through bricks, tiles and even steel. For certain metals you can also buy a specifc blade. What Types of Wood Can Be Cut with a Circular Saw Blade? The biggest use of a circular saw, is to be able to easily and quickly cut through wood of different kinds. So the simple answer to the question, is you can cut any type of wood with a good quality blade. That includes both the softer woods and harder woods. Circular saw blades can also get through composite woods. They can be used for getting through MDF, plywood, laminate flooring, veneers counter tops, floor boards, decking boards and even plaster board and dry wall. If you notice chipping, binding or burning then it is usually time to change your blade. The way you do this will vary slightly depending on the brand and the individual model of the circular saw. The general principle is however always the same. The good news is that it is not as difficult as you may think. The first thing you do though is to unplug it from the electric supply. If you are using a cordless circular saw, then remove the battery before changing the blade. The video below explains how to remove a blade and put a new one on. Which Direction for A Circular Saw Blade? All good blades will have an arrow on them that clearly indicates which direction the blade should be fitted. You can see that demonstrated in the video above. A very good rule of thumb though is that the printing on the blade almost always goes on the outside. How to Sharpen a Circular Saw Blade? My advice here is not to even try and sharpen a blade. All things considered, a general type of blade does not cost a great deal of money. Now of course if you have the know how, you can do this with a vice and a file, but it is a pretty skilled task. Someone with the right engineering skills, and the right tools can do this, but what you would have to pay them for their time, would be more than simply buying a new blade. In the video below, you will see a very cheap but highly effective method to clean any circular saw blade. This is really good especially if you are cutting a lot of wood and the blade gets sticky from the sap. Just below you will find a useful video if you have to cut laminates of any kind. Plywood is popular in the building industry. Plywood is a sheet material that is made from various layers of wood veneer. These layers are rotated with their wood grain laid at 90 degrees to each other. In simple terms a sheet is laid down with the grain running in one direction. Glue is then put on top of this sheet. The next sheet is laid down but had the grain running in a 90 degree opposite direction. This layering continues until the correct thickness is achieved. It is the reversal of the grains of the wood that gives plywood its strength. Like MDF this is a manufactured type of wood. It is cheaper than normal wood and is used to make school desks, wood panels and some flooring. It is very strong, light in weight, and resistant to bending and warping. If you have to cut plywood you should use something like a 60-100 teeth blade, or a general purpose combination blade. MDF as many of you will know stands for medium density fibreboard and it is a man made engineered type of wood. You usually buy it in panels and it is denser than a wood like plywood. The wood is made by breaking down both hard and soft wood into wood fibres, and then mixing those with a resin binder and wax. It is then pressurised and heat treated. Basically it is sawdust held together with glue and it is a cheap wood that is used mainly to make furniture. Cutting it does create a lot of dust particles so it is always recommended that you wear a mask over your mouth when cutting MDF. If you have to cut MDF then you should use something like a 60-100 teeth blade. A general purpose combination blade will also do the job. Most people will never have to cut metal with a circular saw. In the trade metal saws are used to do this. Usually for smaller cuts this is done with the humble hacksaw. Some mitre saws such as the Evolution Rage range of saws have blades that will cut through almost any materials. For example a piece of wood with nails in it. To cut metals such as metal conduit, pipes, sheet metal or square tubing there are a few blades out there. A popular choice is the Spartacus brand. The metal blades are more expensive than the general purpose type and typically you can pay around £20-25 per blade for a metal cutting one of good quality. I am sure you can imagine that cutting through any type of masonry with a circular saw is never going to be easy. Diamond blades are the best choice though as blades hardened with diamond will get through concrete, and are also made to last a great deal longer. These blades will be able to cut stone, concrete, paving slabs, tiles and marble. You can buy these in all the popular sizes such as 185, 210, 230, 255, 305 and 335 mm. There are a few common problems with circular saws and especially with blade changing, so I want to tell you what those are, and more importantly how to fix them, if possible. Sometimes, especially with older saws, it can be really tough to get the blade off. A good way of doing this is to lift up the blade guard, and set the saw on an old piece of wood. Push the blade down until the teeth dig into the wood. That helps to stop the blade from turning as you try and remove the bolt. It is also a good idea to spray the bolt area with something like WD40 or a releasing fluid, and leave that for a while to soak in. Anything that helps break down rust or the tightness is a good idea. A few gentle taps with a hammer on the end of the bolt can often help as well. Likewise, it can sometimes be impossible to tighten a blade. The bore on your circular saw connects with a bolt that goes all the way through to the motor. If the blade is not tightening, then most likely the threads have worn out on the bolt, or on the inside of the motor housing. Sadly if this is the case you will need to replace the saw.